Synovia, more often called synovial fluid,[help 1] is a viscous, non-Newtonian fluid found in the cavities of synovial joints. 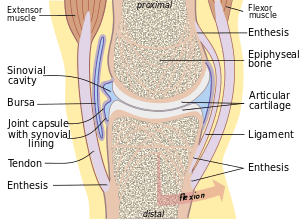 With its egg white–like consistency, the principal role of synovial fluid is to reduce friction between the articular cartilage of synovial joints during movement. shock absorption — as a dilatant fluid, that possesses rheopectic properties, becoming more viscous under applied pressure; the synovial fluid in diarthrotic joints becomes thick the moment shear is applied in order to protect the joint and subsequently, thins to normal viscosity instantaneously to resume its lubricating function between shocks. Synovial tissue is sterile and composed of vascularized connective tissue that lacks a basement membrane. Two cell types (type A and type B) are present: Type A is derived from blood monocytes, and it removes the wear-and-tear debris from the synovial fluid. Type B produces hyaluronan. Synovial fluid is made of hyaluronic acid and lubricin, proteinases, and collagenases. Synovial fluid exhibits non-Newtonian flow characteristics; the viscosity coefficient is not a constant and the fluid is not linearly viscous. Synovial fluid has rheopexy characteristics; viscosity increases and the fluid thickens over a period of continued stress. Normal synovial fluid contains 3–4 mg/ml hyaluronan (hyaluronic acid), a polymer of disaccharides composed of D-glucuronic acid and D-N-acetylglucosamine joined by alternating beta-1,4 and beta-1,3 glycosidic bonds. hyaluronan is synthesized by the synovial membrane and secreted into the joint cavity to increase the viscosity and elasticity of articular cartilages and to lubricate the surfaces between synovium and cartilage. Monosodium urate crystals are seen in gout/gouty arthritis and appear as needle-shaped negatively birefringent crystals varying in length from 2 to 20 µm. With negative birefringence, the crystals appear yellow in parallel light and blue with perpendicular light. When the two articulating surfaces of a synovial joint are separated from one other, the volume within the joint capsule increases and a negative pressure results. 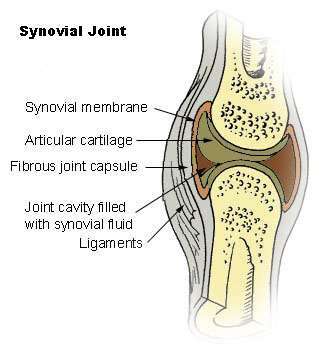 The volume of synovial fluid within the joint is insufficient to fill the expanding volume of the joint and gases dissolved in the synovial fluid (mostly carbon dioxide) are liberated and quickly fill the empty space, leading to the rapid formation of a bubble. This process is known as cavitation. Cavitation in synovial joints results in a high frequency 'cracking' sound. The word synovia (/sᵻˈnoʊviə/) came to English from New Latin, where it was coined by Paracelsus. Several dictionaries indicate that the -ov- syllable of the word reflects the Greek ᾠόν and Latin ovum, cognates that both mean "egg" (which seems appropriate given the egg white–like nature of synovial fluid)—thus syn- + oo-/ovo- + -ia—although several others omit that aspect of the etymology, and one states, "probably formed arbitrarily by Paracelsus." Whether true or false, the connection to ovum is still helpful to students as a memory device. Somewhat confusingly, the inflected form synovia can be either a principal (and uncountable) declined form referring to synovial fluid (synovia) or a second declined form as the plural of synovium (thus "synovial membranes", synovia). The avoidance of this ambiguity drives the use of the term synovial fluid to be more common than the use of its synonym synovia. ↑ West, Sterling G. (2015). Rheumatology secrets. The secrets series (3rd ed.). Philadelphia: Elsevier Mosby. p. 19. ISBN 9780323037006. OCLC 908716294. ↑ Bennike, Tue; Ayturk, Ugur; Haslauer, Carla M.; Froehlich, John W.; Proffen, Benedikt L.; Barnaby, Omar; Birkelund, Svend; Murray, Martha M.; Warman, Matthew L. (2014-09-03). "A Normative Study of the Synovial Fluid Proteome from Healthy Porcine Knee Joints". Journal of Proteome Research. 13 (10): 4377–4387. doi:10.1021/pr500587x. PMC 4184458 . PMID 25160569. ↑ Jay GD, Waller KA (2014). "The biology of lubricin: near frictionless joint motion". Matrix Biology. 39: 17–24. doi:10.1016/j.matbio.2014.08.008. PMID 25172828. ↑ Edwards, Jo, ed. (2000). "Normal Joint Structure". Notes on Rheumatology. University College London. Archived from the original on 19 Nov 2012. Retrieved 5 April 2013. ↑ McCracken, Thomas, ed. (2000). New Atlas of Human Anatomy. China: MetroBooks. ISBN 9781586630973. OCLC 850877694. ↑ Christorpher, GF. "The role of protein content on the steady and oscillatory shear rheology of model synovial fluids". Royal Society of Chemistry. 2014 (10): 5965–5973. doi:10.1039/C4SM00716F. ↑ "Synovial fluid - OrthopaedicsOne Articles - OrthopaedicsOne". Retrieved 20 September 2016. ↑ Sabaratnam S, Arunan V, Coleman PJ, Mason RM, Levick JR (2005). "Size selectivity of hyaluronan molecular sieving by extracellular matrix in rabbit synovial joints". The Journal of Physiology. 567 (Pt 2): 569–81. doi:10.1113/jphysiol.2005.088906. PMID 15961430. ↑ < Oates, Katherine (2006). "Rheopexy of synovial fluid and protein aggregation". The Journal of the Royal Society Interface. 3: 167–74. doi:10.1098/rsif.2005.0086. PMC 1618490 . PMID 16849228. ↑ Hui, Alexander Y.; McCart, William J.; Masuda, Koichi; Firestein, Gary S.; Sah, Robert L. (Jan–Feb 2012). "A Systems Biology Approach to Synovial Joint Lubrication in Health, Injury, and Disease". Systems Biology and Medicine. Wiley Interdisciplinary Reviews. 4 (1): 15–7. doi:10.1002/wsbm.157. PMC 3593048 . PMID 21826801. ↑ "GlycoForum / Science of Hyaluronan". 15 December 1997. ↑ "Joints". University of Washington Medicine - Department of Orthopaedics and Sports Medicine. Retrieved 2013-02-04. ↑ Jay, GD; Britt, DE; Cha, CJ (March 2000). "Lubricin is a product of megakaryocyte stimulating factor gene expression by human synovial fibroblasts". J Rheumatol (abstract). 27 (3): 594–600. PMID 10743795. ↑ Warman M (2003). "Delineating biologic pathways involved in skeletal growth and homeostasis through the study of rare Mendelian diseases that affect bones and joints". Arthritis Research & Therapy. 5 (Suppl 3): S2. doi:10.1186/ar804. 1 2 3 4 5 6 7 Table 6-6 in: Elizabeth D Agabegi; Agabegi, Steven S. (2008). Step-Up to Medicine (Step-Up Series). Hagerstwon, MD: Lippincott Williams & Wilkins. ISBN 0-7817-7153-6. ↑ "Lupus Anticoagulant". Family Practice Notebook. Archived from the original on 18 January 2013. Retrieved 7 April 2013. ↑ American College of Rheumatology Archived September 5, 2004, at the Wayback Machine. ↑ Unsworth A, Dowson D, Wright V (1971). "'Cracking joints'. A bioengineering study of cavitation in the metacarpophalangeal joint.". Ann Rheum Dis. 30 (4): 348–58. doi:10.1136/ard.30.4.348. PMC 1005793 . PMID 5557778. ↑ Watson P, Kernoham WG, Mollan RAB. A study of the cracking sounds from the metacarpophalangeal joint. Proceedings of the Institute of Mechanical Engineering [H] 1989;203:109-118. ↑ "What makes your knuckles pop?". 3 August 2000. Retrieved 20 September 2016. 1 2 3 Houghton Mifflin Harcourt, The American Heritage Dictionary of the English Language, Houghton Mifflin Harcourt. 1 2 3 4 Oxford Dictionaries, Oxford Dictionaries Online, Oxford University Press.